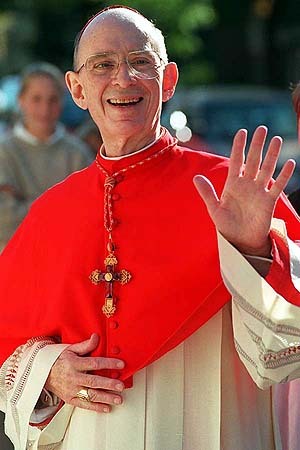 As most of the readership of this blog is undoubtedly aware (thanks in no small part to Kevin Ahern’s recent incisive post), Joseph Cardinal Bernardin remains a controversial figure almost two decades after his death. In December 1983, Bernardin presented the Gannon Lecture at Fordham University, and there presented an argument for the “Consistent Ethic of Life” (CEL). I wish to focus briefly on this lecture in responding to Robert Christian’s fascinating and thought-provoking piece, which argues that the CEL movement has actually been inconsistent in applying their ethical philosophy. Before responding to this point, it would be worthwhile to use Bernardin’s own thought in response to Christian’s essay. I have no reason to doubt Christian’s sincerity in making this statement, so I must express sadness that many in the movement have presented it like this to Christian. When Bernardin introduced CEL a few months after the United States bishops wrote The Challenge of Peace, he explicitly wanted to connect that pastoral letter with other life issues, like abortion, capital punishment, and euthanasia. As the chair of the episcopal committee that drafted the letter, Bernardin understood that the philosophical viewpoint of the bishops ran the gamut on the question of war and peace. Even in the small committee there was an absolute pacifist (Bishop Thomas Gumbleton) and an auxiliary bishop of the military vicariate (then-Bishop John O’Connor). The letter itself certainly did not call for the American church to adopt absolute pacifism as its stance. If anything, its emphasis was on the just war tradition of the church; it called for absolute pacifists and adherents to the just war theory to work together. Furthermore, it called for a nuclear pacifism that all American Catholics could embrace. Such a type of contingent pacifism does not discount the possibility of using military force in situations which meet all the criteria for a just war. However, Christian brings up another interesting question here: is there room for both absolute pacifists and adherents to just war theory in the authentic CEL? My answer to this question, along with Bernardin and The Challenge of Peace, is in the affirmative. While Christian maintains his personal respect for absolute pacifists, he also claims, “But for those that argue that the use of force always results in more death and destruction, my reply is that they are absolutely, unequivocally incorrect in those assumptions and claims.” It is difficult for pluralistic groups of people to work together for peace and justice when such a clearly negative judgment has been made regarding a carefully constructed conviction about a strict adherence to nonviolence in all circumstances. As a means of concluding, allow me to return to Bernardin and CEL. Bernardin ended his Gannon Lecture by making a salient point: “The issues of war, abortion, and capital punishment are emotional and often divisive questions. As we seek to shape and share the vision of a consistent ethic of life, I suggest a style governed by the following rule: We should maintain and clearly articulate our religious convictions but also maintain our civil courtesy. We should be vigorous in stating a case and attentive in hearing another’s case; we should test everyone’s logic but not question his or her motives.” Reflecting on this point made me so grateful that Christian ended his own essay in the way he did, by calling on members of the CEL movement to be more welcoming to adherents to the just war theory and those who advocate the Responsibility to Protect. He is absolutely correct in this matter. CEL is, by its very nature, both exclusive in that it comes from a particularly Roman Catholic setting, but also very inclusive in that its catholic principles encourage a fairly broad spectrum of views on the issue of war and peace. CEL practitioners would do well to take Cardinal Bernardin’s words to heart and open themselves to well-intentioned and pro-life thinkers such as Robert Christian. Daniel Cosacchi is a Doctoral Student in Christian Ethics at Loyola University, Chicago. He is writing his dissertation on the environmental effects of warfare in Catholic social thought. ← Frontline presentation “Secrets of the Vatican,” the ugly truth or misplaced blame?